And so does your story begin It was an auspicious night when the Hunter came to your door. No light from the moon could penetrate the thick, stifling clouds overhead; The birds and crickets had long fallen silent as if they could sense the malice in the air, the only noise was the scream of something wicked in the forest to the south, an evil that tainted the surrounding lands like a festering wound. A thunderous knock signified the appearance of the stranger at your door, tall and broad of shoulder, his clothing serviceable but worn and patched from decades of use. His beard upkempt like that of a hermit living outside of society. Your parents were reluctant to supply this vagabond with hearth and food, ready to deny the simplest of courtiesies regardless of money offered, until a glitter of silver glinted off his arm from the light of the lantern, and silence smothered the room. A glowing silver tattoo, it was remarkable how no one had noticed it before now, so brightly did it shine now that your attention was on it; it seemed to draw you in with its seductive glow, you swear it almost flowed around his arm, as if the silver was alive. A Hunter. You had thought them myths, legends or maybe horrors from days past and best forgotten. As your gaze finally breaks from the silver brand and works up the monster slayer’s form you finally catch his eyes. Steely gray and fixed upon you, and suddenly you realize what that sense of foreboding was; his gaze had always been on you, since before the door had even opened, he had no desire for hearth or home, only you. Your parents protested, begged him reconsider but his face, while heart wrenchingly sad, was resolute. He held up his hands, one carried a small purse of money, the other a thick silver coin embossed with the sigil on his arm and bade your parents choose. They took the purse, and the Hunters lips twisted as if soured, suggesting they took the wrong reward, and told you to pack and meet him outside. Your goodbyes were quick and tearful, your parents already looking past you with bleary eyes as if you no longer existed, or perhaps as if you were already dead. Once outside you see him sitting on the porch, your new Master. Smoking a pipe in your father’s chair as he tumbles the silver coin across his knuckles. As he sees you he straightens and slings his pack over his shoulders, walking southwards without a look to see if you’d follow. After several minutes of silently following you work up the courage to speak. Asking simply where you both were heading and what came next. After a moment of quiet contemplation he stops walking and turns to face you, eyes once again boring into your soul as he whispers three words. The screams from the forest seem louder now. “Overview” Welcome to Ludevine, a historic country of magical beasts and monster, horrors and wonders, home to the Last Citadel of The Hunters. In this campaign the players will be young adventurers conscripted through occult contracts into the ancient Supernatural-hunting organization known as The Hunters. Expect plenty of classwork, field trips, and on the job training as you advance through the ranks of your apprenticeship and hopefully restore the honor and dignity of a long forgotten and much disgraced profession. A relic of a Legendary Empire that lives on only in stories. Race: All Core and Common, everything else needs approval. Age: Teenager/Young adult as per race, Hunters typically start training when young. Alignment: Lets try to stay away from evil if we can. Personality: What makes you tick, hopes and goals, etc. Founded ages ago by a nearly forgotten hero of the First Empire, Ludevine is made of various city-states each under the control of a Lord. The High Lord is the defacto ruler of Ludevine, though he has little power outside the Capital, his own city state. Various underlords run the numerous villages, towns, trading posts, and mining colonies. Landed knights are given control of numerous outposts and control much of the land around them. Ludevine is human-centric, with humans and half-bloods making up over 75% of the population. The next significant population settled in Ludevine are the Elves who live in the Elvish Reserve near the Western Seaboard in the Borrhan Forest. They are an autonomous force who outside of trade makes little contact with the various Lords. Last edited by Mrjoegangles; 03-15-2019 at 02:57 PM. Saving post for myself. You can’t have it. Last edited by Mrjoegangles; 04-08-2019 at 08:47 PM. I may throw in my hat but I'm a bit puzzled at the introduction. Why exactly would my character go with this guy again? Did he just buy us from our parents? If so, why did they take the offer? Was something bad going to happen if they didn't, or are they just cruddy parents? Is it a lucrative profession? I saw the thing about "occult contracts", so did he force our character to go with him through magic? I understand I'm asking a lot of lore questions for just an interest post but this setup is confusing to me. Without delving too deep into the lore it’s basically an agreement between the organization and the lands they protect. They receive x number of resources in exchange for x number of magical silver coins given to the Lord/Mayor/King/whoever paid them. They are also allowed to conscript a certain number of suitable candidates. Usually in exchange for goods/services/children they offer either a set amount of coin or a magical silver coin which basically amounts to a summon/favor. The occult contract refers more to the bond between the apprentices and their respective Hunter Clan (Of which one remains). Last edited by Mrjoegangles; 03-15-2019 at 02:56 PM. Is skinwalker allowed for a race? I'll go ahead and officially throw my hat in, but I must warn you that I have little playing experience with Pathfinder (though I've read through the books enough to have a pretty good understanding) so I may ask mechanical questions from time to time. The only other PF game I've played is an offsite PBP that's stalled. What's the religious situation here in Ludevine? An established pantheon, ancestor worship, some vague overdiety? The Galarion Pantheon is the largest religion in Ludevine and most surrounding countries. There are various offshoots, and other religious practices, and obviously going by game flavor cults aplenty (some demon/devil, others perhaps Eldritch horror). It should be said that certain gods like Cayden who come directly from Galarion will have less an influence. In general a churches power in Ludevine differs based on City-State. Witcher and Buffy inspired? You had me at hello. Personality: Clanks has always been a kind and generally social kid, never the leader of the group or the comic relief he sits in the strange position of influencer by way of wisdom beyond his years. While he is usually levelheaded there are a few things that will set him off, most notably people making fun of his missing arm. He suffered near constant teasing for years from some of the town's older kids and only after he got his mechanical arm has he been able to force them to eat their words. The boy has started to reign in his gut reaction to being treated unfairly but it was only after the most frightening day of his life that he truly understood the price of anger. Little squirrel Tobias had been told a thousand times to be careful in the mill but like all six year old boys he felt invincible and was convinced consequences were a thing made up by adults to scare kids. He had been climbing in the rafters of the mill for over an hour by the time his father had entered, a quickly growing look of fear spreading across his face. "Toby come on down son and go slow okay? It's not safe up there." "But Da..." "Do as I say son and do it now." "Alright, don't know why..." The child's words turned into a startled yelp as his foot slid off a moving rod and he began plumettimg the twenty feet to the solid stone slab. "Toby! The boys father looked on in horror as he fell, the moment stretching out for eternity until the sickening thud rebounded across the walls and resounded within Henry Miller's ears. The boy took a ragged breath, the feeling of broken bones wracking his body, his life only saved by the pile of flour his head landed upon. Before Henry could even try to recover his son the millstone continued on its inexorable path, grinding and ripping the young boys arm off, the pressure partially sealing the wound, a trickle of blood mixing with the flour to form a thick red paste around his shoulder. The next thing Tobias knew he was lying in the local chapel, his body feeling numb other than his right arm which felt like it was on fire from fingertip to shoulder. He tried to bring the limb before his eyes but it didn't seem to want to cooperate so he turned his head and his eyes widened as he gazed upon the empty expanse where his arm was previously attached. His mother and father sat crying nearby but the situation wasn't able to fully penetrate the haze of his mind so he said the only thing he could think to say. "Where's my arm daddy?" The sobbing grew louder in response. Fight smart not mad The one armed boy stood sweating across from his father, the older man not even breathing hard. "One more lap around the house then we start training Toby. Come on." "Training for what?" "Well son to put it blunt your short and with your arm gone you are gonna get picked on. Your ma would say just run away but I remember being a young boy and runnin' ent always an option. Gonna show you why so few in this town are willing to get froggy with our family." The boy didn't fully understand what his father meant but he ran around the perimeter of their land all the same. When he was done his father got in a crouched stance with his hands before him open and waiting. "Put your left foot forward and make sure you keep your hand ready. Our family has always been a bit small so we learned how to make up for that. Legs are stronger than arms by a fair bit so we block with the arms and focus on kicking our opponent. Missing your right arm means you gotta be quick with that hand. Always keep your eyes trained on your opponents hips, the power for every strike comes from the hips and you get good enough at reading the hips you won't have to see the hands to know where they are coming in. Now there is one other key thing to fighting, never fight mad. I ent saying don't fight angry, anger is fuel, but when you let that anger control your actions you will fight mad and at your size fighting mad will just get you hurt. Keep your head in control and fight smart. Think before every hit and think about what comes after. Last bit of advice is always hit through your target. If you are thinking about hitting your opponents face you are going to lose force the moment you make contact. If you are thinking about going through them you are going to keep the force up and do better at hurtin 'em. Let's put this into action. Gonna start slow so just slap my hands away as they come in." The Miller's continued their training late into the day and every day after. When work was done and Tobias had done his studies for figures, letters, and running the mill the two would go out and start training, a long run followed by hours practice reading opponents and learning how to fight. A merchant's mercy Horace had come to Brook's Haven every year for ten years and every year he found the place full of life and kindness greater than any village he visited and deep down he knew one day the peaceful village would be the land he retired to. This year he went with a smile on his face larger than normal because he had a special surprise for the town's miller who had been one of his best partners for years. His garrishly painted wagon rolled it's way up the long road to the hydraulic mill and the quaint and inviting hearth of the Miller's. Horace knocked on the door and a few moments later he was greeted by a young girl whose face split in half with a grin that would light up any room. "Ma, Da, Uncle Horace is here!" The little girl took a step forward and leaped into the merchants arms. A few seconds later a boy a year older came barreling in and embraced the merchant from the side, his one arm squeezing tighter than Horace would have thought possible. The Miller parents walked to the door with a cup of tea to spare and a gentle grin resting naturally and comfortably on their lips. "Hello Horace. Favor a cup?" The merchant happily took the cup as the children untangled themselves and returned to their dinner so the adults could talk. "Your flour sold well as always, Hemlock over in Grensvale wants to double his order. Old Rittan down in Talsburg wants some of that famous Brook's Haven tobacco if you know anyone selling." "Old Rittan hasn't had two coppers to rub together in a decade, how does he plan on affording our tobacco?" "You know his son that went off to fight with that upstart mercenary company that Old Rittan disowned?" ""Cole wasn't it?" "Yeah. Apparently he did a bit of heroics in a real important dust up but he didn't make it out. His fellows gave half what they was paid to Old Rittan for his loss. Vile codger didn't so much as frown at the news and he ain't been afraid to throw his 'grieven coins' around. Bought up Malik's whole stock of cherry mead. The mercs thought it was cause o' him needin' to mourn but unlike them we know he has spent every spare coin on booze since he was old enough to touch a spirit." "Half tempted to say I don't just to spite the rat but I won't let someone lose out on good coin after Traversk's taxes this year. John Tanner on the east side had a good crop this year." "I will check in with him in the mornin I suppose. So you willing to tell me why your tobacco is so good around here? Has an effect stronger than any I've ever smoked." "You show up more'n once a year maybe we will get around to tell in ye but for now just know there is another plant we mix with the tobacco." "Ohh?" "That's all your getting from me. Now come in and let's get ye fed." The trio of adults went inside and all five people are a hearty stew while stories of the hear were traded back and forth by all assembled. Marabell spoke of her excitement for the coming spring festival, her excitement coming more from the food that came with it than finally being old enough to do the maypole dance. Annette showed her newest weaving, a piece fit for a kings halls that would likely end up gracing some dirt farmers floor. Horace regaled the kids with a story the parents could tell was fabricated, mostly because the healthy girth of Horace wouldn't have allowed him to hide from anything that had better vision than a bat. Randal spoke of the quality of the crops and the excitement when Brenna on Northen road thought she had seen a goblin but it had turned out to be a larger than average toad. When it was finally time for Tobias to share he talked about all the training he had done with Randal. The boy was beyond proud and as he finished sharing what he had learned Horace stood from the stool. "That reminds me I need to get your coin for you Randal and as always I got a few gifts to share with the kids." The children cheered as the portly merchant made his way out and came back with a doll in one hand and a case in the other. The doll was an articulating porcelain piece that the girl immediately thanked him for before running off to play with it. The gift the merchant brought Tobias was presented with far more ceremony. The merchant started by placing it on the table and slowly unlocking the case. He opened it slowly and revealed what lay within. Gleaming metal met the eyes of the gathered Miller family but it's function did not sit in right away. Tobias was the first to speak. "What is it?" Horace didn't speak he just retrieved what lay within and began adjusting straps and levers. He slid the open end onto the child's truncated shoulder and began to make minor adjustments until it fit comfortably. "Got it from a gnome tinker I met on the road. He was selling it for a pittance of what it's worth cause he couldn't find a buyer. Thing was cheaper than the doll." Tobias subconsciously clenched the metallic fist and was startled to find it worked, the thing squeezed tight with the twitch of muscles in his arm. "Johnny Ferryman I recommend you and your little gaggle of idiots leave us be, it's a beautiful day and we haven't the time to waste putting you in your place " "Wass that you little runt" Another stone came soaring through the air and this one found it's target, a fresh line of blood appearing on Thomas, the youngest of their group. Tobias swam to the bank and got out of the water, reataching his arm after making sure he was dry. The boys with Johnny all were looking for more rocks but they abandoned the search as all of Tobias's friends now stood with him on the shore, Adam Smith in front as was proper of a leader. "Johnny now we are gonna have to kick your whole group's collective asses and I really wanted to spend the day swimming." Adam was the only one close in size yo Johnny, the young ferry worker was said to be stronger than his father already and his dad was the strongest man in the village far as anyone could tell. Adams heavily muscled form from his work in the forge still looked small across from him but what surprised both groups more was when the diminutive Tobias walked in front of Adam, his metal arm held before him in a defensive pose. "I will take Johnny, you worry about Kade." Without question or retort the larger boy went down the line and squared off against the only other decent fighter in Johnny's gang. Johnny laughed when Tobias began taking short shuffles toward him. "The little cripple thinks he can take me, that's downright adorable. Even if you had two arms you couldn't hurt me runt." "Ask your Da exactly how bad a Miller can hurt you." Laughter turned to rage in the blink of an eye, last harvest festival John senior had thought it clever to slap Tobias's mother on the rump and informed her he would happily show her what a real man can do. Randal had been only a few feet away and decided to show his displeasure. Johnny lowered his head and started running at Tobias who quickly pulled the pin on his shoulder, extending his arm a few feet, and planted his fingers into the soil before jumping to the side at the last moment, letting the enormous boys momentum take him into the arm and send him tu.bling to the ground beyond. Johnny got up and dusted Tobias again, this time to be met by a knee in the chest that sent him stumbling back before he had time to think about hitting the smaller boy. "Clanks you freak, fight me like a real man. Using a weapon in a fist fight." The nickname was one that Johnnys gang had given him within days of him getting the prosthetic and at first it did serve to make Tobias angry but he had gotten use to it in time. "Johnny this wouldn't be a fair fight if I didn't have either of my arms so I will honor your request and not use my metal arm, since your so scared of fighting a cripple on fair footing." The lessons of his father rang I his head as he saw the other boys rage magnify. Johnny was well beyond thinking about any advantage as he charged in, his fist cutting the air beside Tobias's head as he dodged the cumbersome strike, the smaller boy cupped his hand and cuffed the giants ear as hard as he could, the sudden pain of a ruptured eardrum sent the bigger boy reeling. After he got something close to his bearing he came in again, this time a poorly executed snap kick ended with the knee on his plant leg bending backwards at an unnatural angle after Tobias's counter. The young ferry worker was on the ground clutching his leg in agony as the few members of his gang who still stood slowly backed away from Adams gang, the fear of Tobias writ large on all of their faces . Tobias stood out of reach of the larger boy and pulled the pin on. His shoulder, raising the arm to let the extension slide back into place with a satisfying clank. Tobias smiled down at the boy before turning away and beginning his walk back to his friends. "I'll get you for this Clanks. Marabell is about the age for a tumble in the hay eh?" Tobias walked over to the wounded giant and crouched just out of reach above his head. "Keep my sister's name out of your mouth Johnny or you will find my fist in it." The bigger boy laughed and when Tobias stood back up to leave he did the worst thing he could have done in that position. He spat in Tobias's face. In the stories the hero would be merciful and knock his foe out for the insult, the villain would calmly wipe the spit from his face before coldly murdering the offender. There was not enough time between action and reaction for thought, he didn't have the time in his mind to decide to be merciful or cold, he just started punching. He fell on the larger boy in a flurry of flesh and steel and rage. His father's words no longer echoed in. Him as his mind was consumed by a fury far greater than he thought himself capable. He only began to get dragged back to the world as his friends physically dragged him from the twitching body of Johnny Ferryman. At first Tobias thought he was literally so mad he was seeing red but the sheen of blood cleared up when he blinked. His arms and face looked like he had bathed in a river of blood and what he could see of Johnny was a bruised and swollen mess. "I gotta get him to the church." Tobias was let go, his friends seeing their friend once gain rather than the rabid animal that inhabited him moment's before. The smaller boy lifted the larger one, the mechanized arm doing most of the grunt work, and moved as quickly as he could to the town church where his own life had been saved so many years ago. Father Rictor was on the steps enjoying the sunrise but as he saw the bloody boys coming up the road he rushed to meet them, his old frame unbent despite its many years. He didn't ask anything, he doubted he had time, he just laid hands on the larger boy and began to pray. Not long and the wounds sealed but there was still enough swelling that the boys own mother wouldn't be able to identify him. 'He will live. As I was healing him though I felt for his brain and there is a lot of trauma, I don't know if he will be the same boy when he wakes. What happened Tobias?" "I didn't mean to hurt him so bad. He said something about Mary and then spat on me and I just started punching him. I swear Father I didn't ever mean to do... this." Tobias lay the larger boy down and began to weep. Two weeks later Johnny woke up. He couldn't remember what happened and after he woke up he didn't remember anything new too well either. The boy would never be the same again. Taken The hunter came to their home not long after Johnny woke up. Tobias was working on some of the gears in his arm when the man entered, by the sharp intake of breath from his parents he was certain he had been the first to notice the hunters Mark on him. Before the man could say a word his mother was crying, the word no coming fast and repeatedly from her lips. "Our boy ain't one of your monsters, he just got carried away in a fight, it happens. He's just a boy." The man's eyes remained fmtrained on Tobias and for some reason Tobias knew that while the man was here for him it was not to kill him. The little panel on his arm clicked close and Tobias stood up. "He isn't here to hurt me. Let me gather some clothes and I'll be ready." True to his word Tobias got his things together in a knapsack and came back to the door. Both his parents wept now but the coin and the coins were offered. "Take the coins Da, give half to the Ferryman, it's the least I can do for what I did. I'll send money back when I can. I love you all." The young boy hugged his parents tightly for a time before finally turning to the hunter. "I am ready." Tobias followed the man into the night and when they got to the edge of the small town the night air rang with two distinctive noises. Clank. Clank. Last edited by MundayKnight; 04-07-2019 at 12:00 PM. Sounds interesting! I think maybe I'd like to submit a character and see how this turns out! 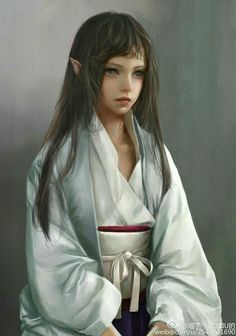 Appearance: A very young-looking elven maiden with long, dark brown hair, jade-green eyes, and fair skin. She wears a long and loose silken robe-like outfit that is out of the ordinary. Though it appears like it may be too voluminous, she still maintains maximum mobility. Personality: She is extremely stoic, and her gaze upon others may seem vacant or alien. She is also quiet, so much so that some may think she has taken a vow of silence. All of it has a grain of truth to it. Avaeril has been trained to always be reserved and ever-so-polite. To think deeply before she ever speaks. Even still, having had very little meaningful contact with others, she is just socially awkward. Avaeril has a duty to fulfill her destiny, the ultimate reason she was raised. There is little else to be said of her motivations. Perhaps upon leaving her home, curiosities and desires of her own may kindle. Or perhaps she will dutifully stay on her path until the day she dies. Background: Avaeril has been raised for a singular purpose all of her life. One dark and terribly foggy night, a Hunter came to the monastery and delivered her as an infant. It was evident that her parents had been the latest victims in a monster attack. "Train this child, and when the time comes we shall come to collect her." The monks did not know what to do, save for do as they were told. They were wise enough to at least know that refusing a Hunter's request was ill-advised. And so began her training from an early age. From the outside it might have seemed like the monks did not care much for Avaeril, but the truth is that they did everything they could to instill their values upon her and to treat her as one of their own. They did not know when the Hunter would call. For all they knew, it could be tomorrow. And so they trained as such. It may sound grim to say, but given the state of the world, the sooner that day came, the better. When the Hunter came, there were no tears or goodbyes: only a polite bow. Her bag had been packed and ready to go for the past several years. The monks took the silver coin, and they watched as Avaeril left with the hunter. Only when she left their sight, did they turn their backs and close the door to resume their ascetic life. World Building: The great monk Vindaloo who founded Ludevine centuries ago (now all but forgotten by most humans) spread his teachings all throughout the world, and some people who found wisdom in his words and became his disciples were a few Elves of the area that is now Ludevine. They founded an unnamed monastery dedicated to Vindaloo's teachings, though as they refined their technique and developed their own styles and adaptations most harmonious with their world view, they called their discipline the Way of the Swift Gale. The monastery itself came to be colloquially called "Candleshoe" by literal translation into Common, which wasn't really accurate. It sits in the smaller forest near the eastern mountains, outside of the Elvish reserve. Only a few centuries ago, when there was fierce conflict with the elves and other city states, many of their brethren were pushed out of the forest, and there was somewhat of a divide in the monastery. In the end, those who stayed out of the conflict remained confined within the monastery's walls. And most who fought in the war and still survived abandoned their ways, disgusted, joining their kin in the Elven reservation, or were forcibly ejected there. As of late the monks of the Swift Gale have hardly ever left their monastery, though they have acted as long-distance couriers on foot in times of great need. Given how dangerous Ludevine is with monsters and supernatural creatures about, very rarely has a monk of the Swift Gale ever been called upon such a mission. Given an elf's extremely long lifetime, there have not been too many new recruits or deaths since the monastery's founding. The few have all been related to monster attacks, and once when a monk fell ill after a courier mission. It has been expanded upon one time, mostly for an extended wall encompassing their large garden, or perhaps more accurately small farm, and another small complex that provides more meager living space. Generally speaking, the monastery is more like a small community without any real leader, though the eldest monks hold more sway. Last edited by DrowNinjaPrincess; 03-23-2019 at 10:07 PM. Appearance: Xander stands tall at 5’11” with a fit and somewhat muscular build. He has short blonde hair with parted bangs in front. His eyes are emerald green in color. His hands are callused from fighting and blacksmithing, and his face is scarred from a nasty blow he took during a rough fight. Personality: Xander does not easily warm up to people, but cares deeply for those he becomes close to. He cares most dearly for his mother and does not take his separation from her well. He seems cold from the outside, but getting to know him reveals a warm, caring heart. He is unabashedly vocal about his feelings and isn’t afraid to tell people what he thinks, whether they want to hear it or not. His greatest interests are fighting and blacksmithing. He enjoys the thrill of duking it out with other competent combatants and likes to be challenged. Blacksmithing is an interest he picked up through his apprenticeship, and he enjoys both the practical and artistic aspects of it. He’s not as good as his mentor was, but he’s decent at making weapons. Xander is persistent in his goals and doesn’t let anyone or anything get in his way. That includes authority figures that might want to restrain him. In fact, he has trouble respecting most authority figures, save for those close to him like his mother or blacksmithing mentor (not his father, though - Xander has no respect for that man given he walked out on his own family). Those who he feels have wronged him especially earn his ire, the Hunters being among them. Background: Xander is the product of a brief relationship between an elven father and human mother who met in Traversk; a relationship that ended with the father returning to the Elvish Reserve due to his frustrations with living in a human environment. For all of his life, Xander and his mother were poor and had to work hard to make ends meet. His mom worked at a tavern as a waitress, while Xander worked as a blacksmith’s apprentice. He often got into fights on the street due to growing up in the rougher parts of Traversk and being bullied by some for his half-breed status. This led to him gaining a knack for hand-to-hand combat and developing interest in the art of fighting. Outside of his blacksmithing job, which helped him develop muscular strength, he started participating in sport fights for monetary prizes. He saw some success as a junior fighter, earning a decent chunk of gold. His mother didn’t exactly approve, but she appreciated the extra money. However, Xander’s junior fighting career came to a screeching halt with the arrival of a Hunter. He had heard the stories about them, but he knew not why one had shown up at their doorstep. The Hunter explained that Xander was being conscripted for the Hunters and had to leave home, offering Xander’s mother a pouch of gold or a strange silver coin as compensation. Xander was incredulous at this, then furious, protesting that he couldn’t leave his entire life behind, especially not his poor mother. He tried to physically force the Hunter out of their house when he refused to budge, but the Hunter easily subdued him with his superior fighting skills and insisted that he had to go. Seeing no way around it, Xander (reluctantly) resigned to his fate and bade his mother a tearful farewell, with her choosing to take the pouch of gold over the strange coin. He then packed his things and went along with the hunter, requesting to stop by his blacksmithing master’s shop to say goodbye. The blacksmith gave him a parting gift: a shining new shortsword with the smith’s symbol, a five-pointed star with a snake coiled around it, engraved on the hilt. Xander and the Hunter then left Traversk and headed to the forest to begin training for his new life. Xander is now highly resentful of the Hunter organization, and he will not let them forget it. If they want to make him one of their own, they’re going to have a rough time of it. The combat training is the only thing they’ll be able to sell him on - he won’t be keen on following all their orders. Even if he ends up living the rest of his life as a Hunter, he wishes to one day return home and make sure his mother is okay - and if he can’t, he’ll at least try to send money her way if being a Hunter pays at all. EDIT: Added a little more to looks. I did not name a home city since I don't know what any of them are like. If you have any issues with what I've got then let me know and I'll address them. Hopefully you are okay with my character being vehemently opposed to what's happening to him to start off. I figured it would be more interesting to not have a character take something like this sitting down, and I think it will make for some more interesting RP. I also hope you don't mind that I altered the way he gets conscripted from the introduction - it'd be weird for everyone to have the same experience and I figured my take on it would fit the character better. Last edited by wymario; 03-21-2019 at 12:29 PM. Thanks for the applications thus far, everyone who has applied is looking great. Please let me know if your application is complete and ready for review/notes/questions/mockery/etc. Well I would have a question... If you can't tell, there is a little bit of an east Asian vibe going on with my character. I'm curious, since it still seems you're in the process of world building if that could be a part of the elven culture. Or if not really, perhaps it has to do with that monastery only? I could maybe help flesh it out if I had more of an idea what you were going for. I also had a question about the age of my character, as mentioned in my first post. It has always struck me as odd how an elf can be older than an adult human, older even than human life expectancy, but still be considered a child. Again, maybe it's just their culture and all. But you did want some somewhat younger hunters anyway. So is 45 a good age for my character? Could it be even younger? Or should it be older still? My thinking is that even if they ARE considered a child according to the culture, they are still more than capable. In fact, that may be a contributing factor to Avaeril's shyness. Last edited by DrowNinjaPrincess; 03-19-2019 at 11:40 AM.